A wedding day is the most stressful day in a brides life. Will the guest be on time ? Is my dress pretty enough for that special man ? Oh, God ! Where’s my creative wedding bouquets ? I can’t believe we left it at the house ! Quickly, grab a cat and walk with it. Yes, a cat; what’s so strange about it ? 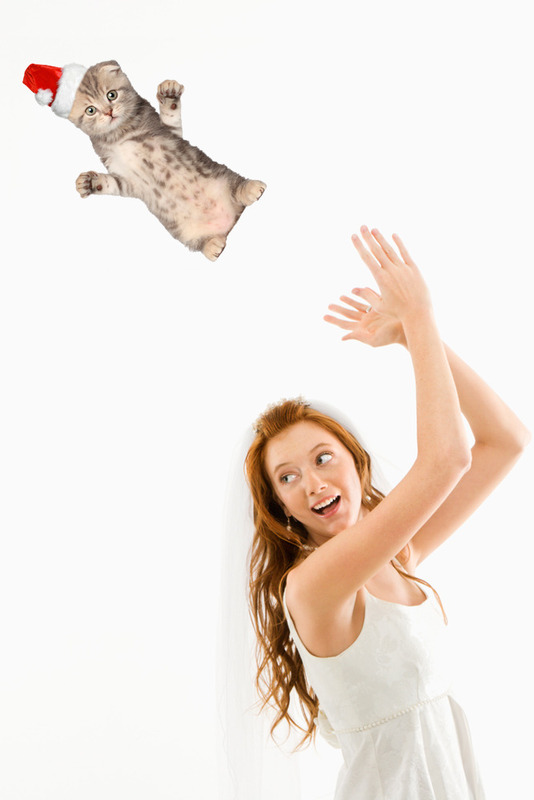 Didn’t you hear about the cat tossing tradition ? A cute kitty cat can be used instead of a bouquet. But, only if you follow these rules. Note: This article is made simply for fun, to make it easy for the brides. Girls, relax and enjoy your special day. Also. no cats were harmed while doing this. First of all, every bride needs to have a wedding theme. You can’t just have an eccentric bouquet on a black tie wedding. This Christmas bride knows about this rule; she chose a beautiful kitten wearing a tiny Santa hat as her bouquet.